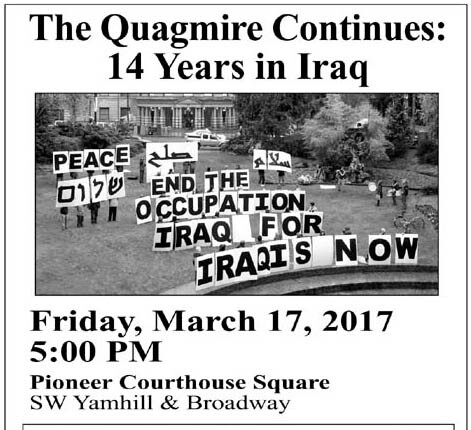 "The Quagmire Continues: 14 Years in Iraq"
Peace and Justice Works Iraq Affinity Group is co-sponsoring the Friday, March 17 Portland Peaceful Response Coalition Friday Rally with the theme "The Quagmire Continues: 14 Years in Iraq." The rally begins at 5 PM at Pioneer Courthouse Square, SW Yamhill and Morrison, with a march around downtown beginning at about 5:20 PM. The US invaded Iraq on March 19, 2003. Even though most of the troops were withdrawn in 2011, they never left completely. With the US' war against the Islamic State starting in August 2014, there are now over 5000 troops in Iraq as "advisors," drone and conventional aircraft bombings, and, with the world's largest embassy, an unending occupation. Although March 2017 marks 14 years since the Iraq War began, one also can look at Jan. 1991-- the start of "Gulf War Part 1"-- as the start of what has now been over 25 years of US hostilities in Iraq. Meanwhile, though sanctions were put in place against the late Saddam Hussein's regime in 1990 to force Iraq to repay Kuwait for their invasion of that country, Iraq still has to make payments despite its dire financial and political situation. Making matters worse, Donald Trump told NBC on January 25: "We should've kept the oil when we got out"-- as if the US had the right to take Iraq's oil. Since then, Secretary of Defense Jim Mattis had to tell the Iraqis we're "not in Iraq to seize anybody's oil" (Reuters, February 20). With a recent announcement that 2500 American soldiers will be sent to Kuwait so they can be forward deployed to Iraq and Syria (Army Times, March 9), it is more urgent than ever to call for the troops to come home. On Thursday, March 16, Peace and Justice Works sent an email to Representative Earl Blumenauer urging him to invoke the War Powers Resolution and have President Trump bring all the troops home. The headline? "Resist! Trump's adding more troops to America's endless wars"
For more information or to endorse or otherwise support this event contact Peace and Justice Works Iraq Affinity Group at 503-236-3065 or iraq@pjw.info. Other cosponsors include Oregon Physicians for Social Responsibility, Veterans for Peace Chapter 72 and Occupy Portland Elder Caucus. Endorsers include Jewish Voice for Peace-Portland, Women's International League for Peace and Freedom-Portland and others. PPRC's weekly rally notice can be found at . A flyer for this event can be found along with other information at <http://www.pjw.info/iraq14yl.html>.